In a stunt that definitely qualifies for the "Don't try this at home" category, American adventurer Jonathan Trappe crossed the English Channel on Friday in a chair attached to a cluster of helium balloons, touching down safely in a French field. 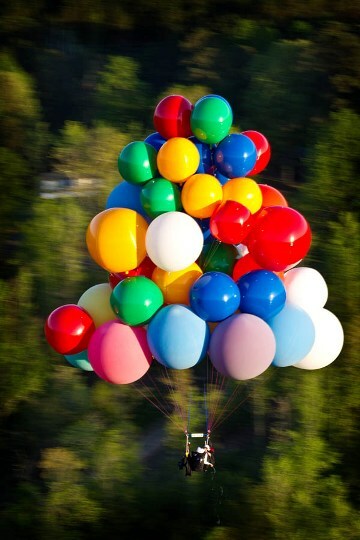 Trappe, 36, of Raleigh, N.C., was strapped in a specially equipped chair below a bright bundle of balloons when he lifted off early Friday from Kent Gliding Club in Challock, England. Hours later, he lowered himself into a cabbage patch in Dunkirk, France, by cutting away some of the balloons. "It was just an exceptional, quiet, peaceful experience," the cluster balloonist told Sky News Television, which tracked the adventurer. When asked what had inspired him to make the journey, Trappe replied, "Didn't you have this dream, grabbing onto a bunch of toy balloons and floating off? I think it's something that's shared across cultures and across borders -- just this wonderful fantasy of grabbing onto toy balloons and floating into open space." Trappe had been planning the flight for several months after setting a world record in April for the longest free-floating balloon flight, covering 109 miles in 14 hours in the skies above North Carolina. The English Channel stunt had several potential dangers, including a risk of drowning if he came down in water, or hitting power lines during his descent. "There are risks, and we work methodically to reduce the risks so we can have a safe and fun flight," said Trappe, who is certified for balloon flight by the Federal Aviation Administration. "Because really, it's only about dreams and enjoying an adventure, and that's only enjoyable when it is safe."